We were all sad to see the wonderful Miss Lucas leave the school temporarily to work with Education Scotland in February. I really enjoyed working with her and the P4 classes on the Gallus stories, and I am thrilled that one of the stories I wrote for a P4 pupil (at his suggestion) is going to be published this year. As Patron of Reading at Comely Park, I need a teacher to be my link to the school, and now I have the lovely Miss McGrow who has gamely stepped into the role! She is a P2 teacher and recently her class were writing stories about a dragon. They were also learning all about the 1960s (When Gran Was a Girl), and so I was invited to come along in April to share my memories of being a kid in the 1960s. As you can see in a separate post on this blog, I decided to collect pictures of all the toys and games I remember from those days, including Silly Putty and Barbie’s little sister Skipper and a Slinky. Not everything started with S – I also brought in a toy Troll with bright orange hair, and a book I particularly loved by Gene Zion and illustrator Margaret Bloy Graham called Harry the Dirty Dog. I had a fantastic afternoon visiting as many classes as I could! I read stories with the P1s and talked about toys with the P2s. Miss McGrow’s class shared their dragon story with me and I had a lovely visit with the P4 classes as well. It was great to be able to tell them about my new book, One Potato, which was inspired by two boys in the class, Kofi and Adam. Thanks, guys! To top off my afternoon, I had a nice chat with Ruby the School Makar, who has written lots of poems to celebrate special events during the school year. Her term is nearly up now, so I wonder if there will be a new competition for next year’s School Makar? 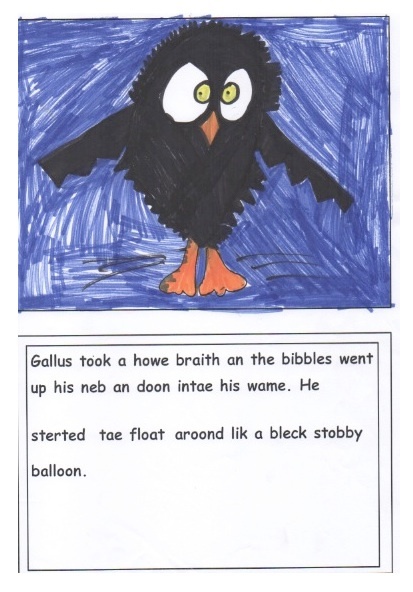 Both P4 classes have been working hard on their Gallus stories, writing first in English and then in Scots, and creating some amazing illustrations for the final books. They are going to have an official launch of both titles, Castle Catastrophe and Trouble Bruin, on Wednesday 27 November, but I can give you a sneak preview of both stories here! 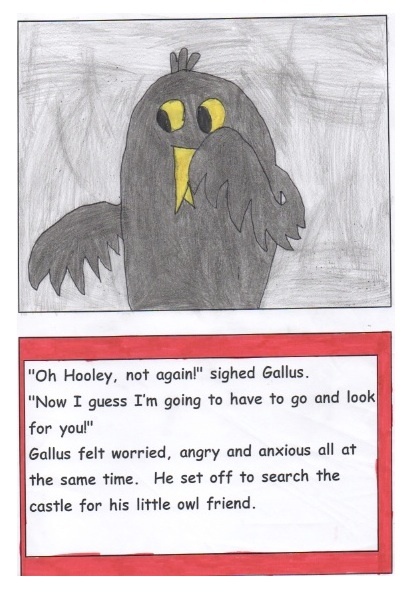 The rest of the story involves Gallus looking everywhere for Hooley, and getting into lots of trouble in the process! 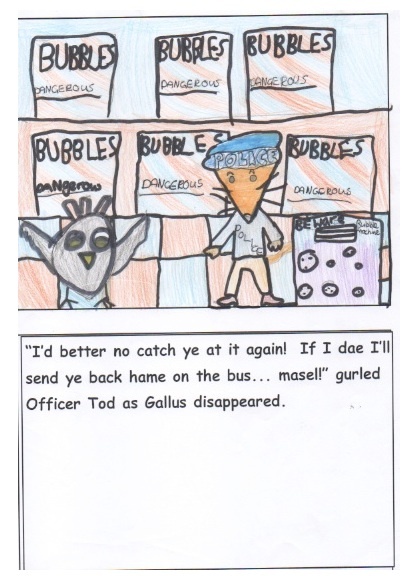 Officer Tod the fox policeman is soon after Gallus, and Hooley gets shot out of a cannon with unfortunate consequences! As you can see, both books are full of fun and beautifully illustrated by the amazing P4 children at Comely Park Primary. I can’t wait to see the finished books next time I visit the school. Watch this space, as I’ll report more soon! The new term has begun and the children at Comely Park Primary are all set for another exciting year of reading and writing! I was delighted that Miss Lucas and the P4 pupils were keen for me to come in September and help them write a story together about a very special character. Gallus the Craw is a cheeky, clever, funny crow who does NOT like to play by the rules. 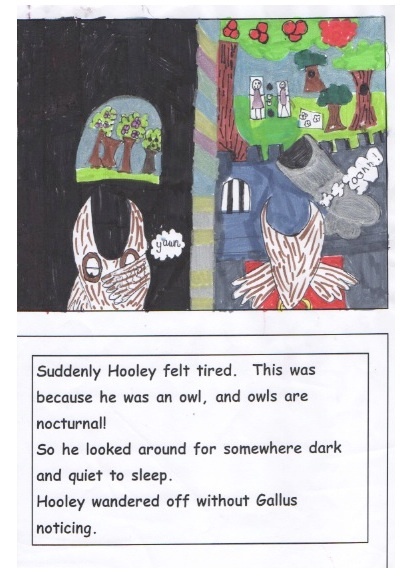 His best friend is Hooley the hoolet, a little owl who is flighty and fun-loving (hooley is Scots for “party” and hoolet means “owl”). Hooley and Gallus (which means “cheeky”) couldn’t be more different. Gallus is black and Hooley is white; Gallus is awake in the daytime and Hooley is up hunting all night; and Gallus is mischievous while Hooley tries his best to be good. I was pleased that the P4s had thought so much about their two main characters, as this is a great way to write a picture book. Most of my books have begun that way, with the idea of a miserable pink penguin, a wild red-haired girl who hates vegetables or a little boy desperate to have a pet. Miss Lucas’s class also have some actual toys to help bring these characters to life. 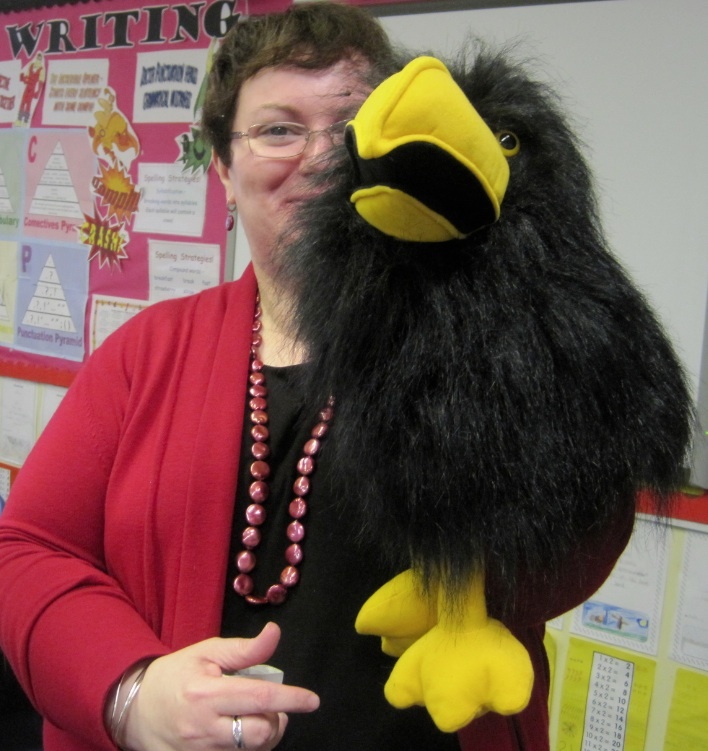 Gallus is a big, hairy crow puppet with a giant yellow beak. Sometimes he looks quite scary when his fuzzy brow gives him angry eyes! Little Hooley is very soft and white, and about a quarter of the size of Gallus. It was great to be able to use the two toys in class to get the children to tell me all about their personalities. Gallus rides off on an old lady’s mobility scooter while she is in the shops, and he rolls down a hill and the scooter falls into the canal! 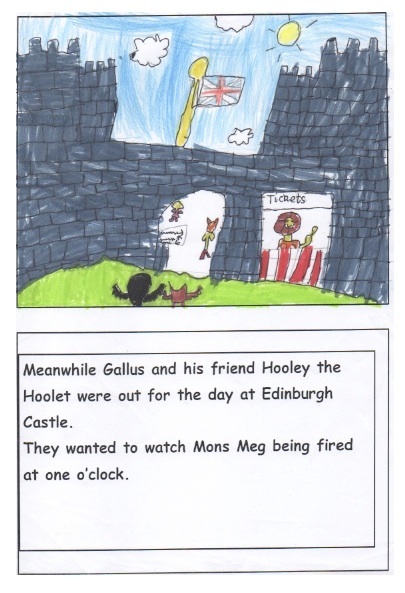 Hooley wants a present for his mum’s birthday so he steals the Crown Jewels from Edinburgh Castle and poor Gallus gets blamed for the crime! Hooley sees something in a shop window that he wants so he flies right at it and knocks himself out! 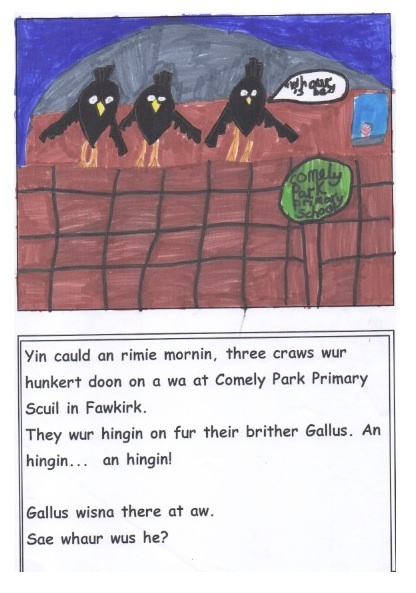 As you can see, the P4 pupils at Comely Park are full of imagination! The next thing we did was give everyone a big A3 sheet of paper with six squares on it (like comic book cells). The children all set about drawing their stories and adding lines of text and speech bubbles to fill in the details. 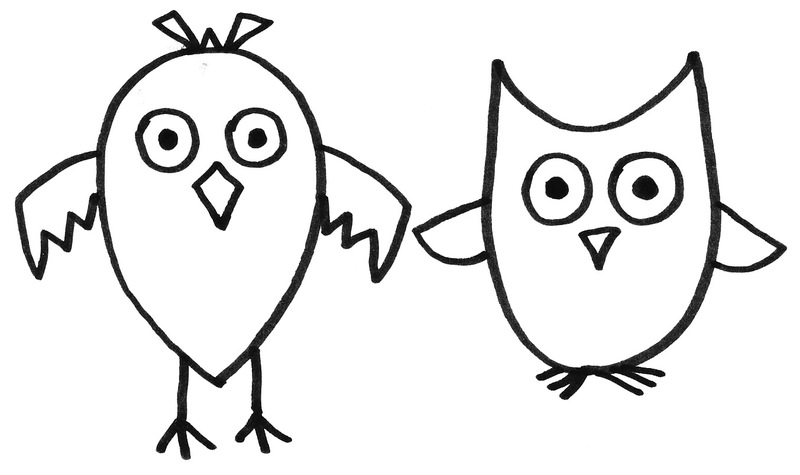 Miss Lucas gave them some tips on how to draw a crow and an owl, using very simple designs. This is how the children drew the two characters, and the stories all looked fantastic! Eventually all the stories can be put together in a little book that the children can share with friends and family. I’m really looking forward to getting my copy too! 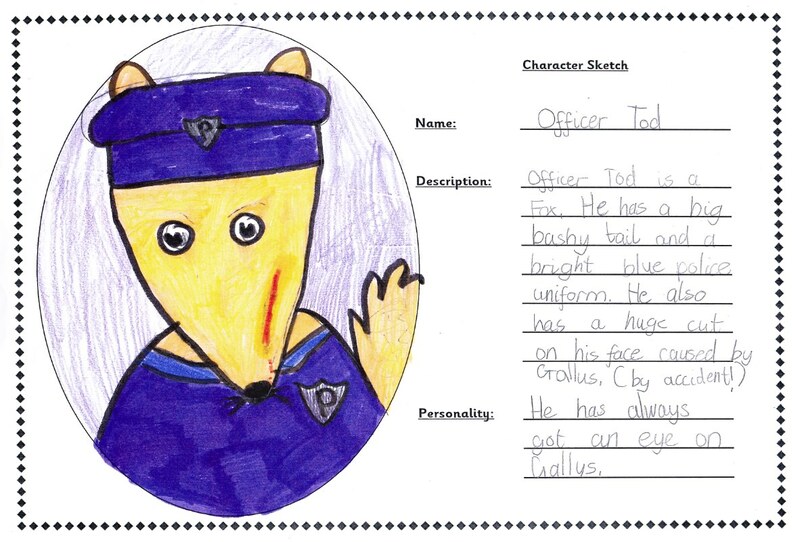 As you can see, Officer Tod is a fox, as the Scots word for fox is “tod”. Officer Tod is sensible, fair and kind, and always has his eye on Gallus. We had a lovely time creating our characters and plot with you when you came to visit. Thank you for giving us tips about writing picture books. We all had a lot of fun and hope you will visit again soon! I had a great day too and look forward to seeing the finished stories. The Comely Park P4s are very creative writers! 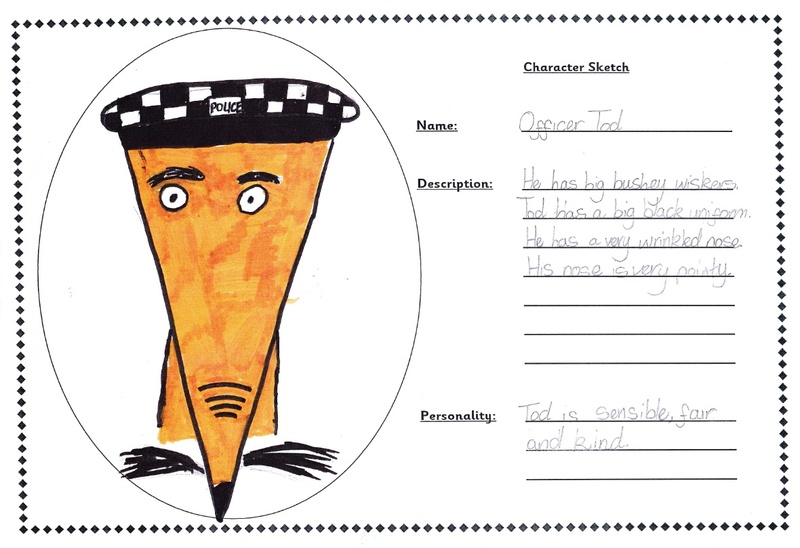 Hi this is Kofi from Comely park p4/4. I just wanted to ask you a question. Did you want to be an author when you grow up? thanks! Thanks for writing! It was lovely to meet you last week. When I was your age I loved to draw so I thought I wanted to be an artist. I went to art school to learn how to illustrate children’s books but I discovered that I liked writing the words much better! I worked as a translator (from French) and an editor until I had my own children. That is when I started writing children’s books, so I became a proper author quite late in life! It just goes to show you can be lots of different things! thanks, i was really looking forward to seeing you! We have done what is going to happen and have thought of front covers and pictures. That sounds like a fantastic story you have all come up with! Is it the Edinburgh one o’clock cannon that Hooley gets fired from? I can imagine how the old lady will react when a little owl lands in her lap! Are you helping to draw some of the pictures? It will be great to see the book when it is all finished. Thanks for writing to tell me about it! I miss you already. i wish you could come back, our story is awsome! See you again! I miss you too! I wish I could come every week! I’m glad you’re having fun writing your story and I know it’s going to be FANTASTIC. I hope I can come back soon, and in the meantime we can chat here! on saturday i am goingt to ghana for my grandmother’s funeral. by the way we have finished our story and we are still planning for our pictures so see you again, All the best! I have just come to my computer and found six messages from you! I am going to answer every one. I’m very sorry to hear about your grandmother. I hope you have a good trip to Ghana. It will be nice to see your friends and family. here is a bit more information about the funeral on Saturday i am going to ghana to see my friends from africa, by the way we are thinking of front covers for our story and some picturs see you again in three weeks! How long does it take to fly to Ghana? I am really looking forward to seeing the Gallus book when you finish it. Have a safe trip! I want to give you a challenge. You have to make up a story about a lost potato, Gallus Hooley and an eagle and send to me in three weeks time starting from saturday after the funeral. I wll really miss you but we can still chat in three weeks but it is a bit long isn’t it? See you again in three weeks, make sure you make up that story because one of my friends called Adam is making up a story about it. See you then! I accept your challenge and will write a story about a lost potato, Gallus, Hooley and an eagle. Three weeks will go by very quickly and then you will be back in Scotland! See you then! Hey Lynne! Just want to know what age where you when you started making books? thanks again, just remember story and my funeral and I MISS YOU SO MUCH!!!!!!!!! I always made books when I was young. I’ll bring one to show you next time I come. My first published book came out when I was 43 (very old). What day is the funeral? I will be thinking of you on that day and will get working on my potato story soon. Hi again, at the top of this page where were you? i just started looking at your blog and it is awsome! hope to see you in three weeks and a day for the story, Adam really wants to make his dream come true! At the top of this page I was on a Scottish island called Iona. You can get there from another island called Mull. They are both very beautiful and both on the west coast. I’m glad you like my blog! I have a website too – just Google Lynne Rickards and you will find it. What is Adam’s dream? Is it a potato story? Yes mostly wierd isnt it? I just heard that you where you were born in Canada have any friends? I really want to see you thats why i keep chatting! see you in three weeks time, [and a day!] i am really exicted but sad because i will really miss you but i will still see your blog. Have a nice day! Yes, I was born in Canada and moved to Scotland about 20 years ago. Did you notice that I have a funny accent? I don’t sound Scottish at all. It’s lovely to chat with you and I am looking forward to my next visit when we can chat in person! I hope you see all my answers to your questions before you go to Ghana. Have a safe trip! Just one more thing before i will miss you and go to ghana. . . What skills do you need to be an author and why? Bye! To be an author you have to love words. I am hopeless at maths but I love words (in English and also in French, Portuguese and Italian which I enjoy studying). I really love writing stories and imagining the illustrations that will go with them. I also love visiting schools and sharing my stories with children. Being an author is the best job in the world, and I am so pleased to be your Patron of Reading! See you very soon! hey lynne one more day till i will go to Ghana. I and Anna are reading champions followed by my sister Ekua . We are going to write a review of our favourite books and send it to your blog today See you in three weeks! Wow, you were up early this morning! It’s great that you and Anna and Ekua are reading champions. I look forward to reading your book reviews. See you soon! PS.sorry I haven’t commented in a while. Nice to talk to you again! I had a lovely time with your class and I’m really looking forward to seeing your finished book. Which illustration are you doing? Don’t worry about commenting all the time – I’m sure you’re busy with school! It’s always great to hear from you. Hi Abby i cant believe that you are replying! Hi lynne it would be nice if you could be an illistrator and an author at the same time could you do that? thanks! Yes, some writers are also illustrators so they are lucky and can do both. Some examples are Oliver Jeffers, Lauren Child, Tony Ross, Catherine Rayner and Quentin Blake. I studied to be an illustrator but found it really hard, so now I just write the words. HI we are choosing the best pictures to go on up in our picture mine is an old lady screaming because Hooley went on top of the old lady as i said on comment six. See you later in three weeks! I think you’ve got a great picture to do! The old lady screaming with Hooley on her lap will be really funny. Have a good trip to Ghana and come back soon! Hi Lynne I just wanted to know what book you had the most trouble with? That’s an interesting question. The story that gave me the most trouble was Jacob O’Reilly Wants a Pet because I had lots more verses (and lots more pets) but I had to cut out half of them and that was hard! Now it has an iguana, an emu and a walrus, but originally I had some flamingos, a pot-bellied pig and a goat as well! Maybe one day I’ll show you those extra verses. Maybe that comes right after Kofi’s picture when Hooley lands in the old lady’s lap! He has to draw her surprised and screaming. Good luck with your pictures! HI Lynne i was going to Ghana but we were too busy that we were too late. Now it’s on Monday. I hope you get there eventually! See you when you get back. Now take 2 for my fllight time now! Safe trip, Kofi – I hope you have a good visit with everyone and look forward to seeing you back at school soon! hi Lynne today we finished translating our story into scots it looks really good you should check it out. Miss Lucas sent me the story with the Scots translation and it looks great! I can’t wait to see the illustrations you are going to do. What will you draw? I think it’s going to be a fantastic book! Thanks and the next thing I am drawing is gullus trying to fly over peoples head in the crown jewels room to see hooley!!!!!!!!!!!!!!!!! I forgot you already said you were drawing the old lady hitting Gallus with her stick. It’s good you get to do another picture as well. It will be tricky showing Gallus flying. Maybe you can make him look like a kite in the sky with his wings out, so we are seeing him from down below. 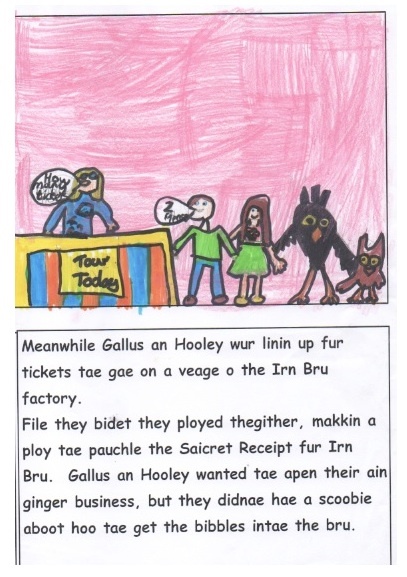 Miss Lucas sent me the other class’s story as well, about a visit to the Irn Bru factory, but I haven’t seen their Scots translation yet. I’m really looking forward to my next visit! I just went shopping for my Halloween costume and I’m going to be a midnight vampire !!!!!!!! A midnight vampire! That sounds very scary! Will you go out trick-or-treating or have you got a Halloween party lined up? I hope you have a great time. P.s Im making a book with a vampire in it. I’m sure you can write a brilliant vampire story with excellent pictures! I hope you’ll bring it in for me to see next time I come. Hi Lynne I just wanted to know what do you have the most fun with writing the story or drawing the pictures. I used to love drawing the pictures when I was young and made my own books (like you), but now with my published books it is always someone else who does the illustrations. I still draw pictures sometimes but mostly I just work with words. What about you? Which do you enjoy most? | like writing the story best since im mostly terrible at drawing. Yes, writing is easier! But I’m sure your pictures will be great too. I am writing a story about a terrible teacher and her curious class! There is a boy calles Billy and he is nicknamed Bad Billy. I am afraid i cant tell you anymore 😦 Sorry! Why is the teacher so terrible? Bad Billy sounds very naughty and I am quite worried about what he will do with that bucket… Hope you can tell me more soon! Do you like the fact that me, Abby and Kofi are all sending you lots and lots of messages? Plus i am going to Portugal on Tuesday and i am really exited about it apart from the fact that I have to get up at 5 O’CLOCK to leave at 6 O’CLOCK in the morning for both of them! 😦 and 🙂 both at the same time. Hopefully I will still be able to talk to you over this chat page if there is wifi there. I LOVE the way we can chat here anytime we like! It’s always great to hear from you guys, and I think it’s amazing that you will still be able to get on the blog even when you are on holiday in Portugal. I hope you have a great time and the sun shines. Splash and Slide sounds excellent, and climbing around in the trees like a monkey will also be fun! Have a great holiday – I’m looking forward to hearing all about it! Writing books all day long sounds like a great plan! I hope I will be able to get some story ideas too during the October holidays. I have promised Kofi I will write a story about a lost potato, so that’s one thing I must do! Thank you Lynne. Are you going to go anywhere for the October holidays? If not, what will you be doing? I will probely be playing in the pool, writing a story or recording things in my travel diary, doing the splash and slide, or the treetop place and just relaxing with my friend if i make one. We might go to Dublin in Ireland for a couple of days. I have never been there before so it should be interesting. Maybe it will give me some ideas for a book! It sounds like you’re going to have a great time – I hope you find a nice friend while you’re in Portugal. I’m looking forward to hearing all about it! I am talking to you on my holidays right now. i am on day 12. Where are you going for your October holidays? I’m boiling right now! Wow – you are writing to me all the way from Ghana! Aren’t computers amazing? I hope you’ve been enjoying your visit with your family. Have you seen your favourite cousin? How hot is it there? We are quite chilly now here in Scotland so it will be hard for you to come back! I am going to visit Dublin next week. I’ve never been there so it should be interesting. I’ll tell you all about it when I see you. Enjoy the rest of your holiday! Right now im in the uk. Just came back. Hi Lynne now its the October holidays Im going to miss gallus. At least we found out who won house of the term Callender came first Dollar come second Victoria came third and helix fourth. Congratulations to Callendar House for their success, and good luck to Dollar, Victoria and Helix next term! I read on the Comely Park website that the four houses are named after local parks. That’s a clever idea! Have a great holiday Abby, and I’m sure Gallus will be very pleased to see you when you get back! I go to ireland at least 5 times a year with my mum and sometimes my dad and we go to Dublin always! Isn’t that a coincedince! P.S. I have a surprise for you soon! I’m looking forward to exploring Dublin, and you and I can talk about it when I get back. Have you been to the National Museum there? I want to see Trinity College too. What do you recommend? I’m sorry about the house quiz. It’s not fun to lose, but I guess we can’t win all the time. Maybe Helix will do better next time. hi Lynne I just went ice skating and I was quite good for my first try!!!!!!!!!! I remember ice skating when I was a kid. It’s not easy at all, so you’ve done well on your first try! I come from Canada where everyone skates in the winter. My dad used to get the garden hose and spray a big area of our lawn with water in really cold winter weather. Once it was frozen, we could skate on it – our own personal ice rink! I would recommend the museum because it has lots of good artefacts- If you need to get anything like food ou something just go to: Nortside, NORTSIDE the great big shopping center! Welcome back! I’d better get working on my potato story. I’m just back from Dublin, and it was very nice. Your new friends have great names! Hi lynne what was the first book that you made and who published it? I like lots of people in canada like Ennis Esmer, Jonathan Torrens and Jessica Phillips from total wipeout! Have you heard from them? My first proper picture book was Pip Likes Snow and it was published in 2005 by Evans Brothers Ltd. I have never heard of any of those Canadians you mention. I’ll have to check out Total Wipeout for myself! I’m glad you had a nice holiday! How was Splash and Slide? Where did Demi and Elise come from? It’s fun making friends from other places. Maybe you can stay in touch by email, or become penpals! I would be very GLAD 🙂 to answer your questions………..
Q.How was slide and splash? A. JUST AWESOME! Q.Where did Demi and Elise come from? A. They both came from England but i dont’t know where about! hi lynne tonight is the halloween disco I am a midnight vampire the dress wasnt very puffy so I bought a tutu to put under it and im getting my nails done and my hairs going to be in a bun I will speak to you after the disco. I hope you have a great time at the disco tonight! Your costume sounds fantastic – you are going to look very scary! I look forward to hearing all about it. Talk to you soon! Hi Lynne, thanks for the story! Adam was really looking forward to it. We have started the illustrations now. Thanks again! I’m glad you like my potato story! I think it would be quite fun to put it to music and then sing it with lots of actions. What do you think? I look forward to seeing your potato illustrations. Thanks for writing! We are P4/3 and we’d like to thank you for posting details about our book launch on your blog! It was really exciting to see our work on the computer. We hope you enjoyed reading our story -we’ll ask Miss Lucas to send you the English version of Trouble Bruin! Some of us will be writnig to you from home later this week – we are really excited about our Book Launch and Book Week Scotland being at the same time! Glad to hear you liked seeing Castle Catastrophe and Trouble Bruin on my blog. I think they are both amazing and I love all the illustrations you’ve done! What excellent authors and illustrators you are! 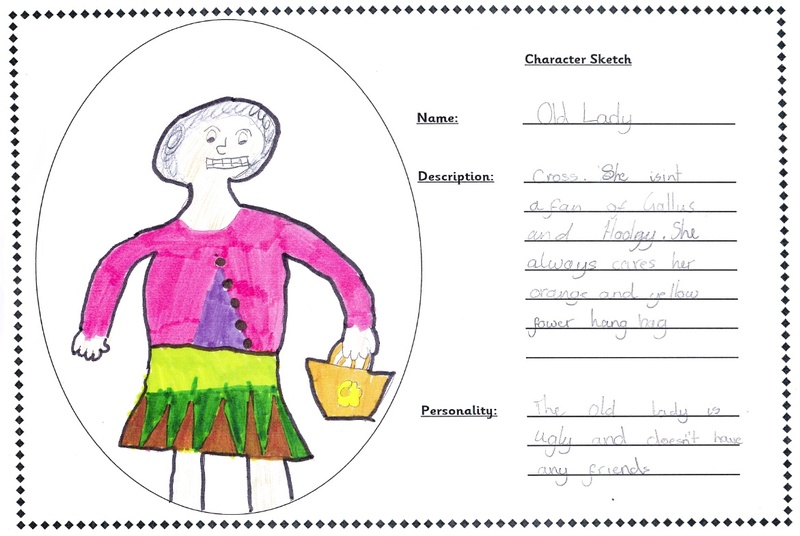 I look forward to hearing from you – I just love getting messages here from Comely Park kids! We have just read your potato story and we think it’s epic and awesome! We are going to illustrate it and send you the pictures (P4/3 let us look at their illustrations to give us some ideas). I’m glad you like One Potato and I can’t wait to see your potato illustrations. I will definitely add those to the blog, too! Thanks for reading! Would there be any chance if you could write a story about a circus with animals that like it there but try to escape but don’t? If not it’s ok.
I’m really glad you like the potato story. You can thank Kofi for it because without him I never would have written it! I am looking forward to seeing your potato illustrations. The idea of the story was to help kids learn how vegetables grow (underground, on vines and so on). Did you know before reading it that potatoes grow underground? I have another post on this blog called How do fruit and vegetables grow? It’s amazing how often people visit the blog to find out! I will have to get thinking about a circus story. I do have one you might like, but it’s an alphabet book so the animals are just having fun. I can send that one to Miss Lucas and you can do circus illustrations next! Thank you for writing the circus story! Our favourite book is I do not eat the colour green!!! I’m glad to hear that! 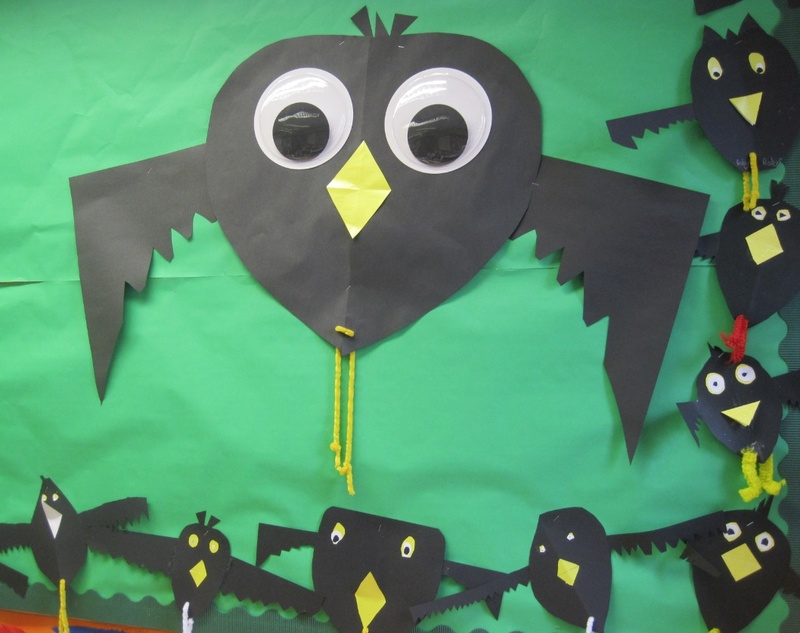 Are you the same Willow who came a close second in the School Makar competition? It’s a lovely name, and quite unusual. I wrote a series of stories about a little mouse called Willow. She is quiet and shy but full of imagination and creativity! Maybe you’re like that too? I am really glad Willow likes reading your books, but she should actually be asleep! Oh, yes – it is rather late. Goodnight, Willow! Thanks for a great time at the book Launch. I hope you’ve enjoyed it as well. By the way i’m trying to make a story as well. I really enjoyed the book launch, and you did a fantastic job as Master of Ceremonies. I should have taken more photos at the beginning when everyone was singing but I got some good shots later on. I wonder what your new story is all about? Some crazy Brussels sprouts, perhaps?